Hi all, I started this topic as a catchall for conversations on all the high value congeners chased when producing rum. HVC's includes esters, noble acetals, noble volatile acidity, and what ever rum oil is (rose ketones and goodness knows what else). There is room to talk about harmony, philosophy, and how the fate of everything high value is bound to fusel oil. We therefore investigated whether it was possible to identify characteristic constituents within other categories of substances, and in particular among secondary alcohols and phenols. In addition, our work focused on the identification of a very characteristic constituent of rums, inspired by the work done at the beginning of this century by MICKO (1908). 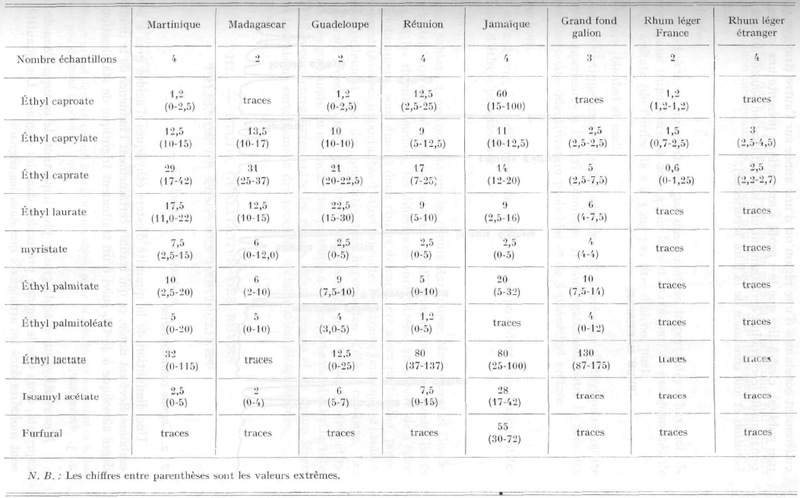 It appears to be more abundant in the grand arôme rums than in other types of rums, suggesting that it might form during alcoholic fermentation, as reported by MICKO about what he called rum oil. What they perform is a bit exotic and startlingly expensive. A lot of the same organoleptic insights can be obtained from the birectifier method. I'm drawn to the comment about Calvados and acetals dominating. I've yet to do a Calvados birectifier case study. The first question raised by me is don't you think a whiskey would have more ethyl lactate? And then secondly, why do they have a column for isoamyl acetate for rum, but not for the other spirit categories? Have you considered adding damascenone to a sample of fairly pedestrian rum? Maybe a quick and dirty blind tasting. I've done this myself with many other esters. It's fairly insightful, or at least helps establish a sort of confirmation of the relative importance of a component. I see that Aldrich has small samples available for $40, relatively cheap test. 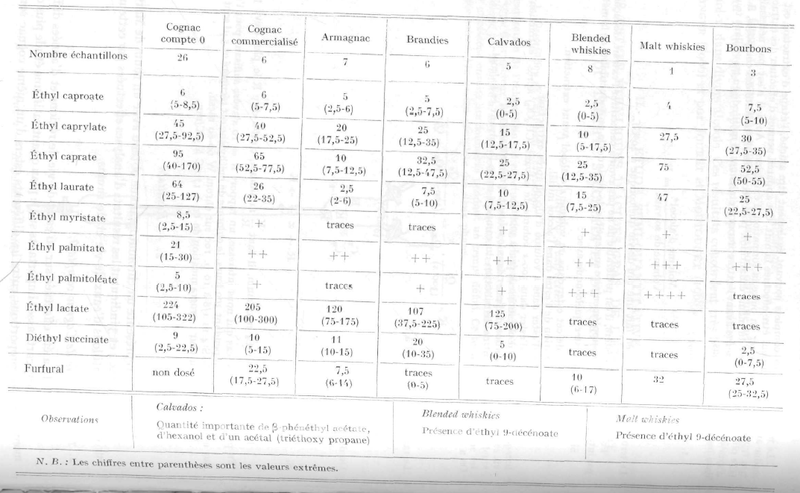 I would imagine, with a set of reference compounds, you could run trials to establish exactly where in your birectifier fractions specific constituents would fall. You could pair that with reference samples of these compounds, and it would be a very interesting organoleptic tool. For example, just making things up, if damascenone falls in fraction X, you could do a test birectifier distillation, check fraction X against a sample of damascenone, and establish not only presence, but an idea of rough quantity. It would take some significant legwork to run all the test distillations (ethyl alcohol+Compound). A nice set of references - positives and faults, would build out a very nice little analytical kit. Damascenone is a norisoprenoid ketone mainly found in red wines. It occurs naturally in tomato and grapes. Huh. My partner is obsessed with doing a tomato brandy. I think it could be interesting based on that. His test batches so far have been interesting. Side note - there's a bunch of reference papers at the bottom of the page. I've done this myself with many other esters. It's fairly insightful, or at least helps establish a sort﻿ of confirmation of the relative importance of a component. I'm itching to get reference for all the rose ketones and play with them. I wrote a post called Sensory Sketches for Apprentices where you take fractions and systematically add them to a whole distillate to see how they impact the sensory matrix. It takes a time investment, but you can learn a ton. I'm hoping that if we finish the birectifier automation kit, we can create case studies for a bunch of distillations with isolated esters to see what happens. Something I'm really curious about is the place of the odder acetals and what they feel like organoleptically. Damascenone has the potential to be everywhere carotene is, but it may not be too important until it is at levels where its radiant sensory properties emerge (to borrow a word the perfumers use). I think the best way to sum up radiance is that it increases the threshold of perception of ethanol, making a spirit feel more mellow while decreasing the threshold of perception of other odorants, like esters, making them seem more intense. It also dramatically increases persistence. Specialty GCMS studies find it everywhere in trace quantities, but if it isn't easily observable with a low resolution tool like the birectifier, it may not be too important. "How low pH can intensify beta-damascenone and dimethyl trisulfide production through beer aging." This is the paper, I'm going to grab first. One thing that sets rum apart from other spirits, is sometimes have a wildly low pH, like vinegar process rums that Hampden makes, and also the long resting periods where these compounds may form by what the beer industry called "staling". When you maximize the multiple channels of formation, something very special may happen. Tomato brandy has some cool theoretical potential, so does carrot.